Congratulations for our local Edward Jones Firm taking top spot for the 19th time! For the 19th time, the financial services firm Edward Jones ranked No. 1 in WealthManagement.com/REP. 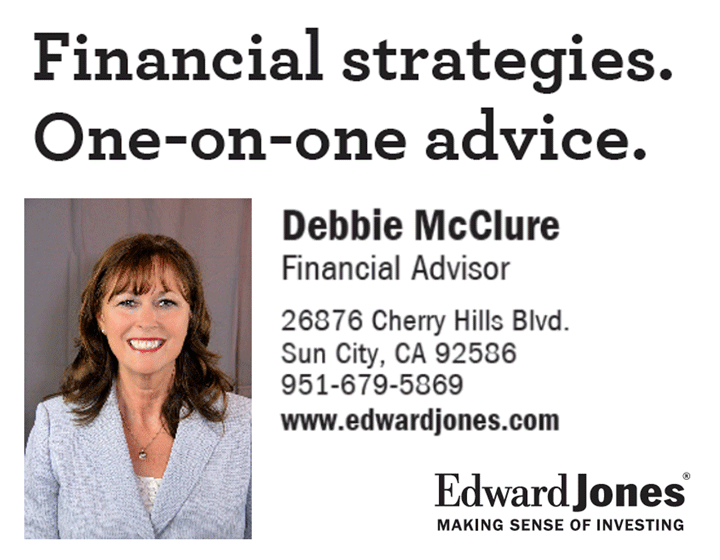 magazine's annual survey of the nation's six largest financial services firms, according to Debbie McClure, an Edward Jones Financial Advisor in Menifee The magazine randomly selects financial advisors nationwide and asks them to rank their firms in various categories. Edward Jones' overall score was 9.5 out of 10 possible points. The firm scored top marks across the board, earning near perfect scores in overall eithic (9.8) and public image (9.7), according to WealthManagement.com. "This honor is a testament to the enduring strength of our firm values, our trade offs and our partnership," said McClure. "We are guided by a clear mission to serve the serious, long-term individual investor and to provide the best career-long opportunity for financial advisors who take pride in their work and appreciate the importance of the work we do." Edward Jones financial advisors gave the firm some of the highest scores in the technology and training category, scoring high above the other five firms in every sub-category which includes the quality of technology, clarity and online access of client account statements and ongoing training. According to WealthManagement.com, between Oct. 7 and Nov. 7, 2013, invitations were emailed to print subscribers and advisors from various firms in the Meridian-AIQ database requesting participation in an online survey. By Nov. 7, 2,333 completed responses were received. Financial Advisors rated their current employers on 33 items related to their satisfaction. Ratings are based on a 1-to-10 scale, with 10 representing the highest satisfaction level. live and work. The firm's 12,000-plus financial advisors work directly with nearly 7 million clients to understand their personal goals -- from college savings to retirement -- and create long-term investment solutions that emphasize a well-balanced portfolio and a buy-and-hold strategy. Edward Jones embraces the importance of building long-term, face-to-face relationships with clients, helping them to understand and make sense of the investment options available today. Headquartered in St. Louis, Edward Jones ranked No. 8 overall in FORTUNE magazine's 2013 100 Best Companies to Work For ranking. Visit our website at www.edwardjones.com and our recruiting website at www.careers.edwardjones.com. Follow us on Twitter @EdwardJones. Member SIPC. FORTUNE and Time Inc. are not affiliated with and do not endorse Edward Jones products or services.